In a new post to his site Derick Rethans talks about "analemmas" and shows how to use PHP's own DateTime handling to determine the locations of the sun at different intervals (that's what an "analemma" tracks). Last week I listened to an The Sceptics' Guide to the Universe where the word of the week was "
But as I am currently starting to update the Guide to Date and Time Programming for a second edition, I was wondering whether I could create an analemma from existing PHP functions. Unfortunately, PHP only provides functionality to calculate when the Sun is at its highest point, through date_sun_info(). He includes an example of this function in use to determine the time the sun was at its zenith. While PHP by itself can't calculate the position, Derick remembered a PHP extension he wrote that could help: php-solarsystem. 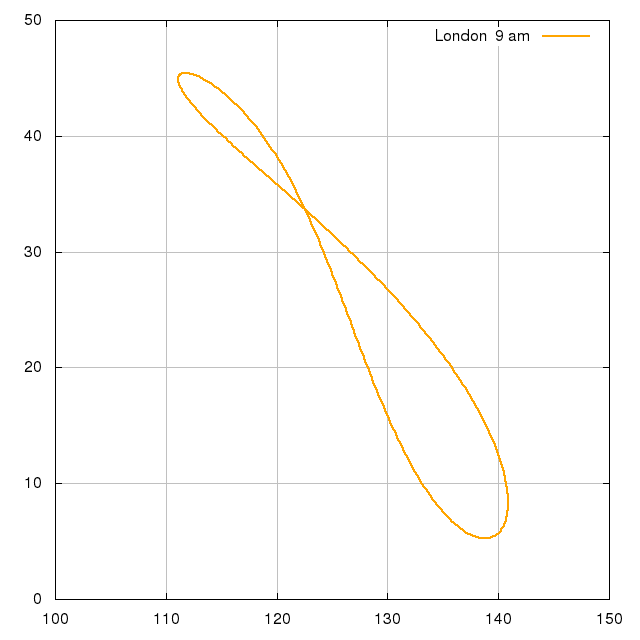 He includes some code using this functionality to iterate and locate the sun via its azimuth and altitude based on his choice of location (London). The result is a CSV export of data that he then drops in to gnuplot to create the graph of the analemma during that time. Jordi Boggiano, author and lead developer on the Composer project has posted his latest updates sharing the PHP version statistics for the first part of 2017. He starts with the differences between now and the last time he ran the stats with a nice trends towards the PHP 7.x releases, especially PHP 7.1. He shares some graphs of the overall version distribution and a time-related graph showing changes in usage over time. Finally, he ends the post the same way as the others showing requirements of packages and how they've changed since the last update (what version a package requires). Leonid Mamchenkov has a post to his site showing how he solved an interesting problem in one of his recent projects: determining the order to use items based on their dependencies. One of the projects I am working on at work presented an interesting problem. I had a list of items with dependencies on one another and I needed to figure out the order in which to use those items, based on their dependencies. He gives the example of database tables where it would be required to export the tables so that the relations between them are maintained when imported back in. He gives some example data, a basic nested PHP array, and defines the relationships between them (just strings in this case). While he did solve the problem, he wasn't happy with the solution. Instead he went looking for other options and found graph theory to be a good match. He briefly cover what the theory involves and links to an example that basically does what he needs...but is written in Python. He finishes off the post sharing his refactoring of this logic into PHP including a recursive "dependency resolver" and the output showing the correct ordering for loading objects based on their dependencies. On his site Carlos Buenosvinos has a new post talking about the experience they had at @AtrapaloEng with PHP 7 and shares some of the improvements they've already seen so far. On Monday, Badoo blogged about its migration to PHP7 (https://techblog.badoo.com/blog/2016/03/14/how-badoo-saved-one-million-dollars-switching-to-php7/). Those are great results! At @AtrapaloEng, we’re running already tests in production to perform the same step. We could have started some months before, but we’ve been struggling with the php-msgpack extension and its (un)support for PHP7. We hope to deploy PHP7 in all our server during this week but we would like to share with you what we have seen so far. They share some graphs showing the changes when PHP 7 was deployed on their systems for both memory consumption and overall load average. They also talk about the boost in performance as far as response times and, an often not reported statistic, how it sped up their unit test runs too. The Symfony Finland has shared some benchmarks of the latest versions of the Symfony framework (simple applications) on three current environments to see the differences: PHP 5.6, HHVM 3.11 and PHP 7.0.1. Since the first functional versions of PHP 7.0.0 were made available, there have been a number of benchmarks comparing PHP 5.6, HHVM and PHP 7. [...] The recently released eZ Platform is a CMS built on the Symfony framework. It's a good representation of a modern PHP application with complex functionalities and no legacy code from the 2000's. Thus making a good candidate benchmarks for testing an application built with the Symfony Framework (version 2.7.8). So let's see how an application built with the Symfony2 framework fares on PHP 5.6, HHVM 3.11 and PHP 7.0.1. He starts by describing the test setup including the default installation of the eZ platform and how it was configured/set up. He then shares the results, showing memory usage and response times for each of the three different platforms. There's even results from different parts of the application: the front page and the "Top Stories" and "Projects" pages. The results also include the findings for the number of requests per second both with and without the Symfony Proxy included in the platform. Joshua Thijssen has an interesting post to his site talking about Benford's Law, related to digits and how frequently they would appear in results based on significance. In a new talk I’m currently presenting at conferences and meetups, I talk – amongst other things – about Benford’s law. This law states that in natural occurring numbers, the first digit of those numbers will most often start with a 1 (around 30% of the time), and logarithmically drops down to the number 9, which occurs only 5% of the time. [...] Even though there is no guarantee that something will actually follow Benford’s law, a lot of things do, and in fact, it can be used for things like fraud detection: in your taxes, in elections, but basically anything concerning numbers. [...] But anyway, I wanted to see Benford’s law in action for myself, so I’ve come up with a simple test: Take a (PHP) framework, and count the line-numbers for each PHP file in the framework. He shares the script (well, command) he uses to get these counts and how he did the sorting to help make some sense out of the results. He includes some of the results and graphs showing them to help visualize the Benford’s "curve" the results take. Interestingly enough, most of them follow the trend very closely with only slight variances for Zend Framework v2 and only them because it fluctuates more, nothing to do with the quality of the framework. The Platform.sh blog has a post showing you how to create flamegraphs with XHProf for your application's execution and overall performance. A "flamegraph" is just a different sort of graph stacking up the execution times for the methods and functions in your application so they look more like a "flame" than just numbers. One of the most frequent needs a web application has is a way to diagnose and evaluate performance problems. Because Platform.sh already generates a matching new environment for each Git branch, diagnosing performance problems for new and existing code has become easier than ever to do without impacting the behavior of a production site. This post will demonstrate how to use a Platform.sh environment along with the XHProf PHP extension to do performance profiling of a Drupal application and create flamegraph images that allow for easy evaluation of performance hotspots. While they show it at work on a Platform.sh instance, the method can be altered slightly to work with your own application with the right software installed. Their example uses the brendangregg/FlameGraph library to do the majority of the graphing work. He shows how to have the code switch on XHProf during the execution and where to put the file for later evaluation. They include the resulting directories and files created from the execution and how to view the resulting (SVG-based) graphs directly in a browser. Luciano Mammino has a quick post to his site with information that tries to help make Symfony authentication simple (well, maybe). The Symfony2 security component has the fame of being one of the most complex in the framework. I tend to believe that's partially true, not because the component is really that complex, but because there are (really) a lot of concepts involved and it may be difficult to understand them all at once and have a clear vision as a whole. [...] Going back to the Symfony2 security component, the point is that I found out difficult at first glance to get a clear idea of what is going on behind the scenes and what I need to write to create a custom authentication mechanism. So in this post I will try to collect few interesting resources that helped me understanding it better and a graph I drawn to resume what I learned. He provides a good list to some of the other resources that helped him along the way including several blog posts and links to the Symfony "cookbooks" about creating custom providers. He also shares a graph showing the full flow of the Symfony authentication process including commentary about each step.